Mount Vernon began as a country estate for Revolutionary War hero John Eager Howard and grew to be the place to live for Baltimore’s rich and famous in the mid-nineteenth century. The Garrett family, owners of the B&O Railroad, the Walters, founders of the Walters Art Museum, and the Thomases, owners of Mercantile Bank, are among the families that built handsome mansions along the four parks that surround the Washington Monument. The recent renovations to the two-hundred-year-old Washington Monument are the latest news from the revival of this historic neighborhood over the last decade. Join us on a tour to hear the stories behind the Washington Monument and see the landmarks of Baltimore’s grandest historic neighborhood. If you are able, you can climb the Monument’s stairs for a birds-eye view of central Baltimore! Space inside the monument is limited. Each tour is capped at fifteen people and we’ll meet at the south entrance of the monument. Our Monumental City tours are guided walks exploring iconic Baltimore landmarks in Downtown, Jonestown, Federal Hill and Mount Vernon the first four Sundays of the month from April through November, except holiday weekends. 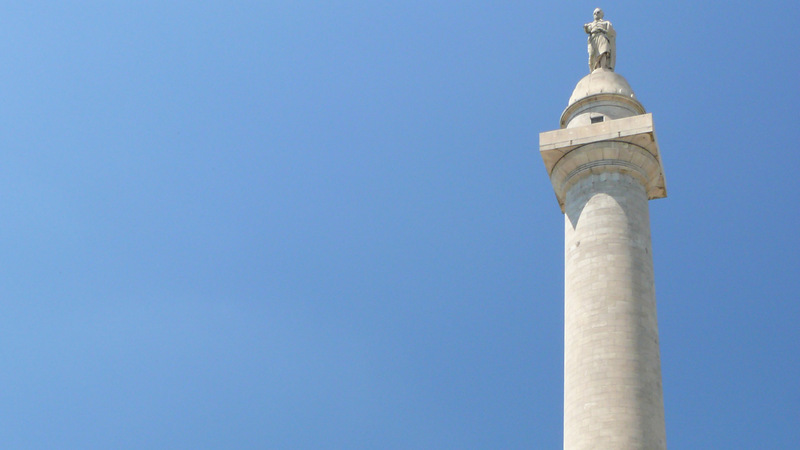 Our Washington Monument tour is organized in partnership with the Mount Vernon Place Conservancy. Limited free on-street parking is available around Mount Vernon. Off-street parking is available at the Baltimore Sun Garage (601 N. Calvert Street - enter from East Monument Street), Central Parking (600 Cathedral Street), and the Franklin Street Garage (15 West Franklin Street).